We moved around when I was growing up, so by the time I was eight years old, my idea of “family” had dwindled down to just the four of us. I didn’t see my grandparents very often, and the rest of my extended family was spread out so far across the globe that I wouldn’t see some of them again until I had a family of my own. Despite not having aunts and uncles, cousins, or grandparents at the house for Sunday dinners or to celebrate birthdays and holidays, special occasions never felt lonely or simple. My mother went overboard making everything shine, decorating the entire house, and celebrating with a special dinner, homemade desserts, and piles of packages. Thanksgiving has always been my favorite holiday. It’s got all the love and joy of Christmas, without all the excess, and at it’s core, it’s about family. I remember as a child waking up to the Macy’s Day Parade on T.V. and my mother, in her robe, puttering around the kitchen simultaneously making breakfast and starting dinner. I remember lying around on the couch in my pajamas until noon and scanning the newspaper ads for Christmas ideas. We ate early, around 3 pm, and my dad would insist that my sister and I dress up; nothing was too fancy. We used the good tablecloth and the wedding china. My mom lit candles and poured wine, and my sister and I drank soda out of goblets. My father was firm on bowing our heads and praying before eating, and although I don’t remember ever stepping foot in a church as a child, it just seemed appropriate. 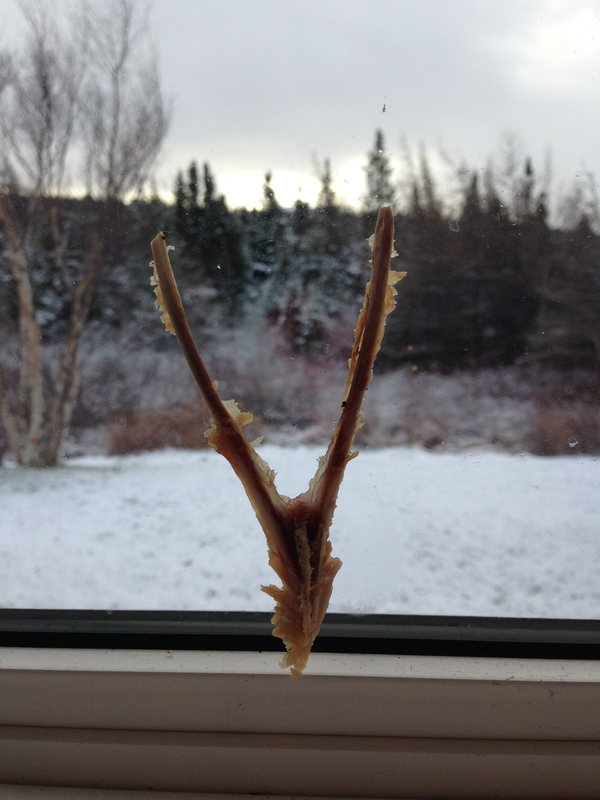 My favorite part of the day was after dessert, when my sister and I could snap the wishbone my mother had dried out in the window. I don’t remember any of the wishes, but I’m sure they were for Barbie houses and roller skates, a cabbage patch doll or a new puppy. I do remember shutting my eyes tight and silently wishing so no one would hear, and I remember the anticipation as I grabbed my shaggy end. It was magic. My sister would always ask what I wished for, but I would never tell. I knew how it worked, and I knew if I won, for a moment, I had the world. This year my husband took a job in Newfoundland, Canada, so it’s our first holiday without our families. For my husband, this is an exciting adventure. He grew up and lived in the same neighborhood his whole life, surrounded by aunts, uncles, second cousins and godparents; he was ready for a sense of independence and separation, but for me, there’s sadness. For as long as I can remember, my family was my sense of stability. There were always going to be new houses and new bedrooms with new wallpaper, and there were always going to be new schools and all new friends, but the one thing I could count on staying the same was the four of us, and our traditions were as solid as we were. Now, everything seems a bit fractured. I followed my husband to Canada with the hope of keeping our new family intact, but in the process, I was losing my old one. We celebrated the Canadian Thanksgiving in October, but I wasn’t into it. We opted out of the traditional Newfoundland Jigg’s Dinner, salt beef with root vegetables and cabbage (sometimes, or so I’ve heard, cooked in a moose heart) and instead made a turkey and mashed potatoes, but we threw together boxed stuffing, and I didn’t make the sweet potatoes or the cranberry relish. There was no celery stuffed with cream cheese or black olives, no green bean casserole or Jell-O salad. My son came to the table in basketball shorts. I may or may not have worn sweatpants. When my husband carved the turkey, I felt like crying. When had he become the patriarch? Suddenly, I was missing my dad’s dinner toast and my mom’s cloth napkins and pink crystal goblets, and I was missing my sister, and I was missing our tiny, four-person place setting. It was my first real holiday away from home, and I was missing all of it. I don’t know how my mom did it all those years, all by herself, thousands of miles away from her own mother. How did she single handedly perfect the holiday and still come to dinner with jewelry and makeup, and how was I supposed to become that for my family? And then it dawned on me that maybe through it all, she was sad and depressed too. Maybe she spent the morning crying in the shower like I did and missing her family and friends, but maybe she pulled herself together for us. Maybe she knew how important these tender holidays were for my sister and I, and maybe, just maybe, she did it all for herself too. Maybe she made everything so beautiful and so perfect to keep all that loneliness away. In spite of dragging my heels through the holiday, I did manage to save the wishbone. I let it dry in the kitchen window, and my son and I broke it together. I won. I wished for happiness and good health for all of my loved ones, and then I wished for myself to welcome new adventures and to always keep growing. My son said I had too many wishes and that I had to choose one, but I told him there were no rules on wishes. This year, I even said it out loud.